Succulent tail-off Shrimp in a garlic, butter & parmesan cheese sauce. Good seafood that’s good for you. You don’t need to hire a chef to treat your guests to a meal that will take their taste buds straight to Tuscany. Simply place the Bake Perfect Oven Bag in the oven and presto! You’ve got yourself an Italian Classic without the classic prep and mess. UNCOOKED. KEEP FROZEN UNTIL READY TO COOK. DO NOT MICROWAVE. 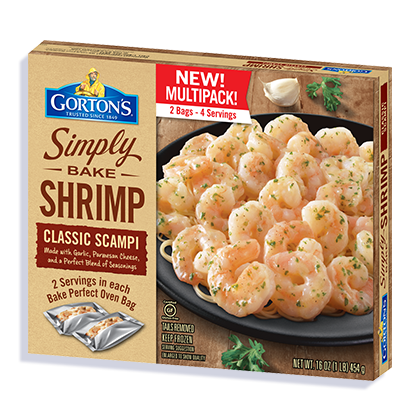 *FULLY COOK SHRIMP TO AN INTERNAL TEMPERATURE OF 145ºF OR HIGHER BEFORE SERVING. Shrimp, sodium di-, tri-, and polyphosphate (to retain moisture), sodium bisulfite (preservative). Water, margarine [palm oil, water, soybean oil, salt, natural flavor, soy lecithin, beta carotene (color), vitamin A palmitate (preservative)], modified corn starch, garlic powder, gelatin, maltodextrin, parmesan and romano cheese (milk, cheese culture, salt, enzymes), butter (cream, salt), salt, natural flavor, whey, spices, parsley, nonfat milk, dehydrated roasted garlic, dehydrated onion, colored with turmeric and annatto extracts.